are the teams allowed to do unlimited engine tests in the garage? and how does FIA control the windtunnel useage? @mike: The engine manufacturers can test on dynos back at their factories to try to simulate the stresses a PU goes under. I'm not sure exactly how the FIA monitors wind tunnel time, but each team has to demonstrate that it has only used either 30 hours in the wind tunnel or 30 teraflop of CFD data or a combination of both. Laurence could you please explain the engine homologation rule? If i am saying this correct. Am I correct every team has 66 tokens for engine performance upgrades? Honda also? @JanVisser: 66 tokens would represent changing every one of the listed components in the engine. In fact the existing manufacturers (Ferrari, Mercedes and Renault) have 32 tokens to spend, but that is still a huge amount. They can spend them at any point during the season, but it looks like Renault and Mercedes are keen to speed the majority of theirs before the start of the season. The PU has to be homologated before the start of the season, but unlike previous years, further performance tokens can be spent later in the season if a manufacturer desires. Honda is the odd one out as it's new to the sport, so it has to homologate its PU on March 2. Up until that point it can work on any facet of the PU to improve performance. It will also be given tokens to spend based on an average of how many the others have left. So, let's say Mercedes spends 22, Renault 17 and Ferrari 12 (just an example) then Merc would have 10 left, Renault 15 and Ferrari 20. Honda, as a result, would get 15 to spend as that is an average of the others. Oh I see. Great info. Just want to thank you guys for doing an awesome job. Melbourne can't get here fast enough! @BC Here's a pic of the Ferrari to demonstrate. 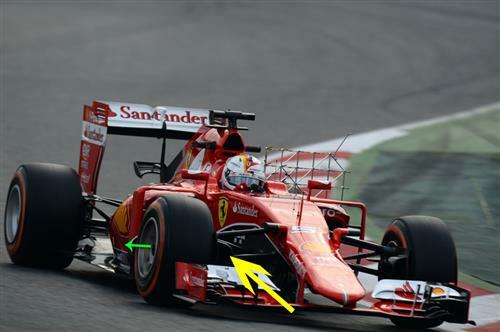 The air goes in the oversized brake duct (yellow arrow) some is used to cool the brakes as normal, but some is channelled through the wheel and out of the centre of the wheel nut (see green arrow). It helps to manage the turbulent airflow coming off the front tyres around and down the side of the car. Teams are always looking for clean airflow and the pesky tyres have a habit of messing that up. This is idea to try to deal with that. Good news for Force India fans, Hulkenberg has improved to fifth fastest with a 1:27.404 on the medium tyres. Still a long way to go, but progress is taken in small steps at this stage of a car's development. @asdf: First off, the air is going through the wheel and not the tyres. But the best way to think about it is two channels for the air - one for the cooling the brakes as per usual and one for the blown wheel nut. It's why the brake ducts on cars with blown wheel nuts are so much bigger than the ones without. @Laurence, Do you think Mercedes will have as much downforce as Red Bull next season? My opinion is that, the reports praising the W06 Sounds like there's a very very strong possibility that they will have the same amount of downforce as Red Bull. What do you think? "There is no doubt that the Red Bull is losing time on the straights compared to the other front runners, especially now that Ferrari has raised its game in that area. Rosberg was the slowest Mercedes engined car on the straight today, meaning that they have a lot of downforce. He was half a second faster in both Sector 2 and Sector 3, which are the ones that indicate downforce levels. So they are in a luxurious position, while Williams is still a little skinny on downforce in low to medium speed corners." We knew Mercedes had a lot of downforce last season. Only Red Bull had a tiny bit more, sounds like Mercedes have put a lot more downforce in this season. Do you think Mercedes will have as much downforce as Red Bull next season? If sounds like they might have the same amount of downforce as Red Bull. @Brad: Interesting stuff from James Allen and tends to correlate with our own conclusions. There are two number of factors in top speed times - power and drag. It all depends on what the teams are testing as to what settings they will use. I think Mercedes aero package was probably under-rated last year as everyone praised the PU. But you have to remember it is a joint effort. Some aero gains may be sacrificed for cooling purposes and this year the key has been getting more power from the PUs with less cooling. That has a huge impact on drag, so isolating PU and aero is not that useful, I think. @Rishi: ICU? Anyway, I can inform you that Honda does make the ERS but has also benefited from McLaren's know-how in that area. But ERS units are manufactured in Japan - we don't need another McLaren conspiracy story doing the rounds. Sorry, just got in, is there anything wrong with the Mclaren again, since Magnussen only did 7 laps?? @BogdanKrstic: Just updated the times and in the last 45 minutes McLaren has added another 13 laps, so no major issues right now with Magnussen currently on track. @Ethanpayne: Soft tyres for that time. But it looks like quite a long run so he must have a respectable amount of fuel on board. @Laurence, Yeah I know, Ted Kravitz said Mercedes don't need to change the Aerodynamics cause they had such a advantage with it, he said Mercedes are just tweaking it this season to make it even better. Yet the PU got all the credit, which I didn't think was fair on the people who designed the Aerodynamics and Chassis. If you had to give a answer of the top of your head right now? Do you think Mercedes will have as much downforce as Red Bull? If you had to just give an answer what would you say? I'd say yeah. For like the firs time in Formula 1 it looks like there's 90% chance a team is finally going to match Red Bull downforce levels. What answer would you give though? @Brad: Mercedes has made some pretty big steps with it's aero package. A lot of people are saying it's the same, but it's quite clearly not. An evolution, sure, but plenty of work has gone on at Mercedes over the winter, make no mistake. Downforce levels are very difficult to calculate, as I mentioned in the previous post it's a drag v downforce trade off along with cooling requirements for the PU, gearbox etc. I wouldn't get too hung up on who has the most downforce as you will never be able to say for sure without access to the wind tunnels. The overall package is what matters and that is measured by lap time. Given the limited running, why not let Jenson test all 4 days? Would his neck not cope? @Hugh: That might be a reason, but after so much time in the garage, I think Jenson would have been happy with three solid days (assuming that's what McLaren achieve). However, Magnussen will be doing lots of work in the simulator this year, so it's no bad thing for him to get some track time. I don't want to spark a bunch of speculation because the indication is that Alonso will be fine for Australia, but if he is not able to race under doctor's orders then Magnussen would be the replacement. However, I should stress that it sounds like Alonso will be fit, we are just waiting on confirmation. @Laurence, Oh thank you. Yeah Mercedes have changed a lot, Your friend Nate said that Mercedes have even changed the wishbone and everything, well he didn't say changed, he said Mercedes have made it more extreme, sounds exciting! 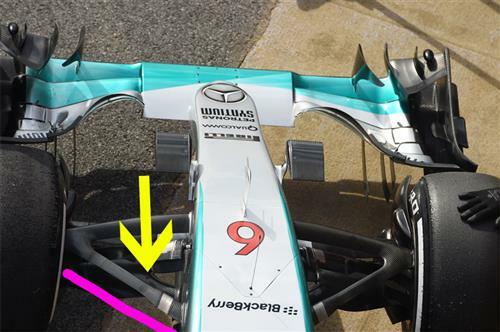 Here's a look at the lower, front wishbone on the Mercedes. 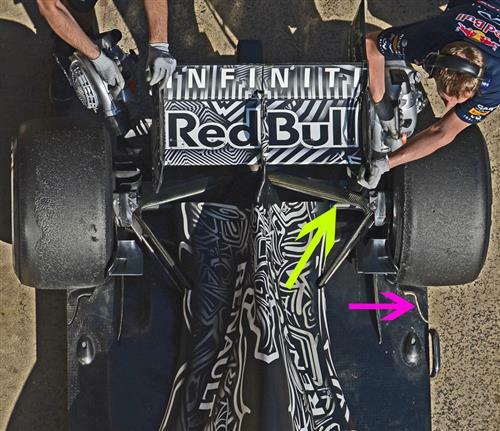 The rather scruffy pink line (apologies for my Photoshop skills) is where you would expect the trailing arm of the lower wishbone to go on a conventional design. The Mercedes design helps streamline the all important aero to the underside of the car but is not easy to achieve given the forces going through the suspension. @grahamg: Usually at a test the tyre "marbles" and debris are swept away at the end of each day. But because there isn't much overtaking going on, it's not really as essential as it is on GP weekend. Meanwhile, Massa has gone fastest with a 1:24.950 which I believe was set on the mediums. what tyre was hulk using in his 1.26 lap? It is not as simple as comparing Mercedes aero and PU. When their aero guys go to Brixworth to sit down with Petronas and the engine guys to design fuel that mixes better with the air, and an engine that helps it mix that is real teamwork. I guess Ferrari/Shell do the same, and possibly Red Bull help Renault/Total, but Mercedes seem to do it better. Hi Laurence, do we know if there is a lot of suspension trickery going on under the skin of the cars or is this pretty standard across the teams? A few technical issues of our own just then, but we are back with you for the start of the afternoon session. @FerrariFan: All depends on fuel loads. But I think it's safe to say the Mercedes is quite a bit quicker at the moment. I think Force India are impressive. 76 laps and decent times right out of the box. Any team would be happy with that, let alone a small budget team like Force India. I'm impressed. @FerrariFan: Mercedes probably have anywhere up to another 0.5s additional pace still left in the car.